This card might win the award for worst Relic in the game (Dark Sarcophagus is right there with it, but at least it can theoretically go in any Yog deck). It was fixed somewhat in the printing of Tablets of Nhing. 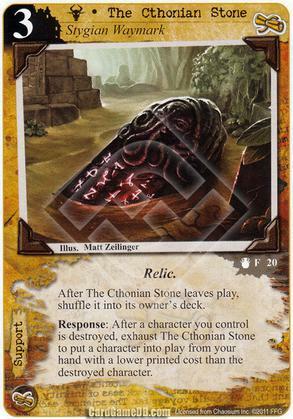 The fact that the Stone can only go into a MU/Shub deck, in addition to its extremely narrow effect and high cost, make this Relic the ultimate stinker. That said, I have a special place in my heart for cards with out-of-faction steadfast. Lodge Barkeep, Endless Interrogation, Somnambulant Dreamer, and all the rest are just so much fun. My greatest disappointment with this game is the out-of-faction steadfast mechanics weren't explored further. Sure, it's a design restriction, but I enjoy trying to decipher what the game designers were on about. My theory is this card was intended to combo with Khopesh, given both the nature of the effect and the not-so-subtle depiction of Cthulhu in the art. That means a 3-faction deck and a lot of effort setting up your support cards, but I didn't say it was a good combo.